With attention to detail in every room, lovely furnishings, and filtered lake views, this wonderful townhome is sure to please. 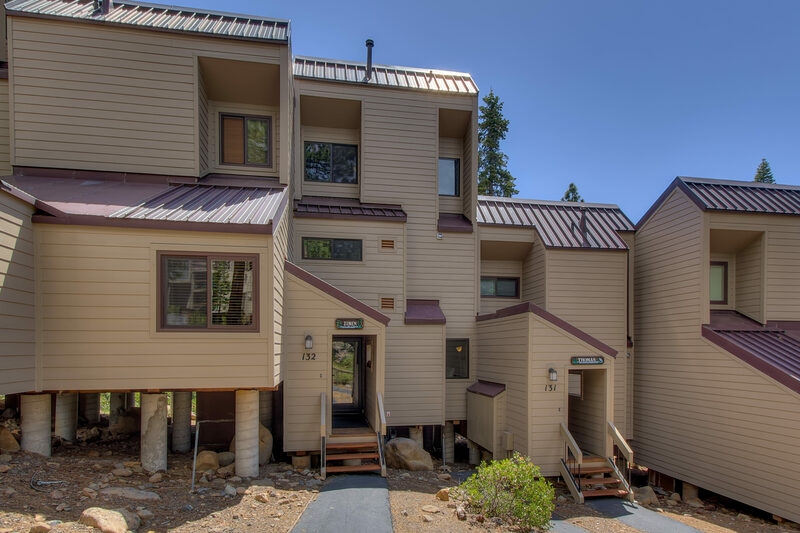 Located in the Carnelian Woods townhome complex in Carnelian Bay with room to sleep eight, look no further than Silver Pine! The entry level includes two bedrooms. 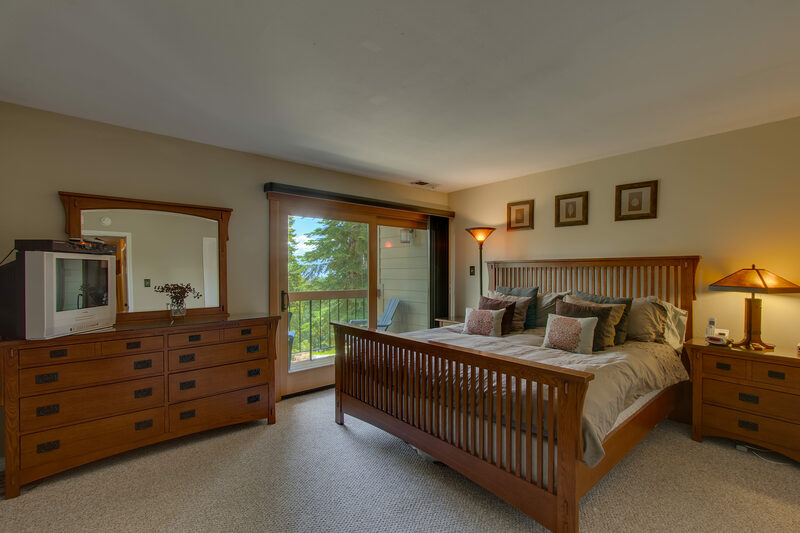 The master bedroom has a king bed, TV with cable, and a glass sliding door to the covered deck where you can enjoy the beautiful views. The second bedroom has a cozy queen-size bed. 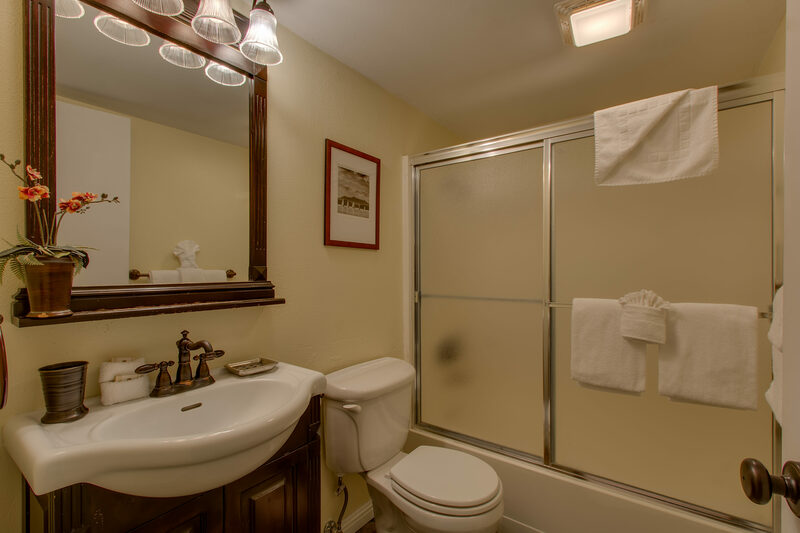 There is also a full bath with a tub/shower and the laundry closet is across the hall. On the second level, spend quality time together where the living room, dining area, and kitchen are all open to one another. You’ll also find the second full bathroom. Plenty of bath linens are provided. 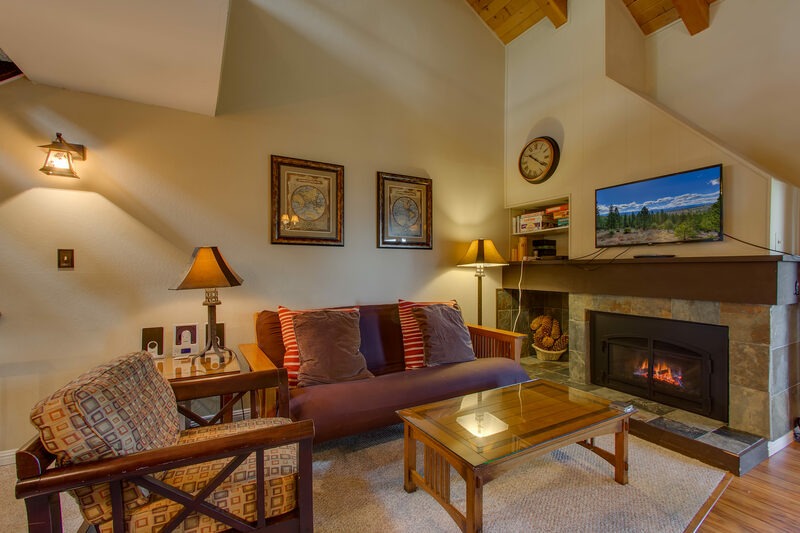 In the living room, relax and warm up by the cozy gas fireplace with slate accents. There’s a comfy chair and a new queen-size futon sleeper, a large flat screen TV with cable and DVD player. 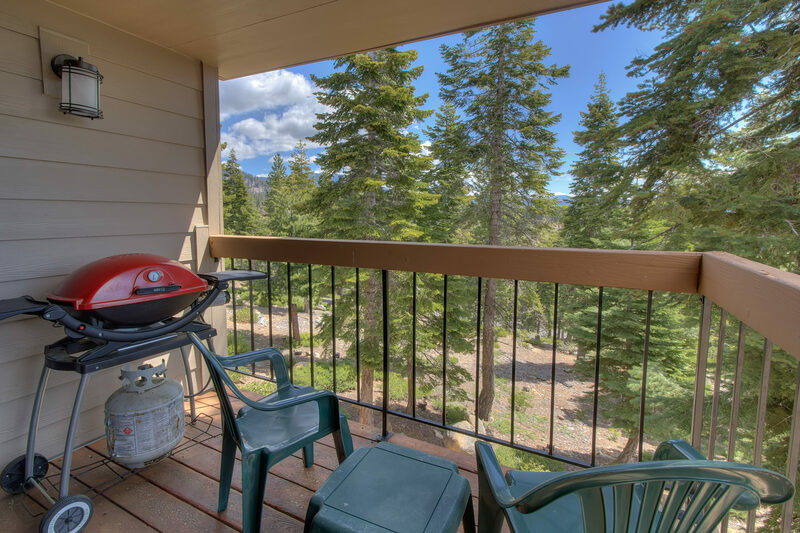 Wi-Fi keeps you connected and the adjacent covered deck features a gas barbeque and more glorious views. With all those mouths to feed, it’s handy to stay in for some of your meals. 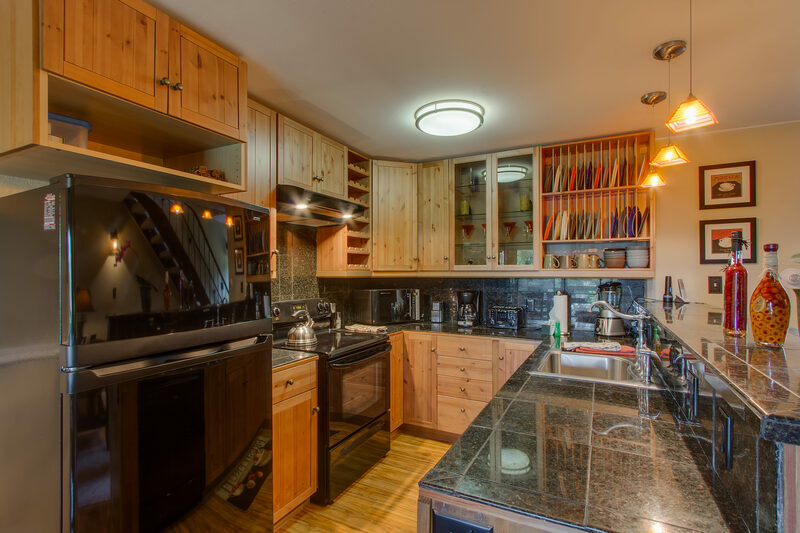 The well-equipped, recently updated kitchen includes granite countertops and backsplash, new appliances and cabinets—everything you need—especially the all-important dishwasher. 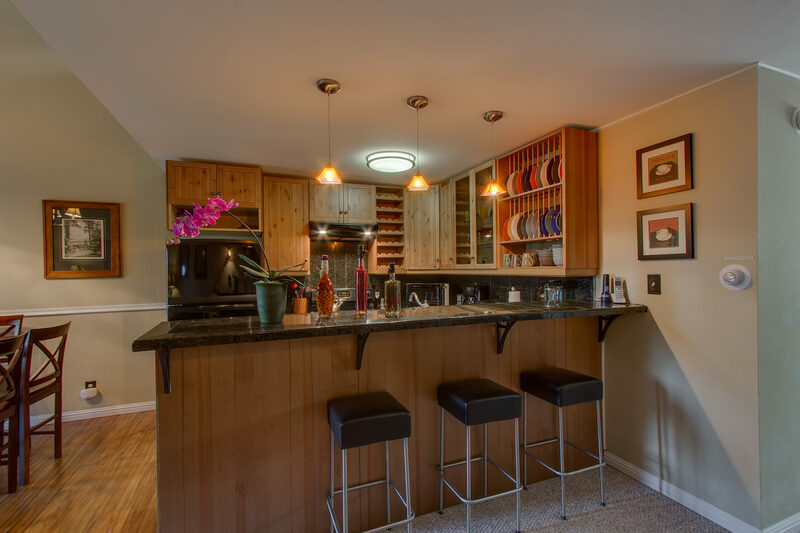 There are eight chairs at the large dining table and three stools at the breakfast bar. 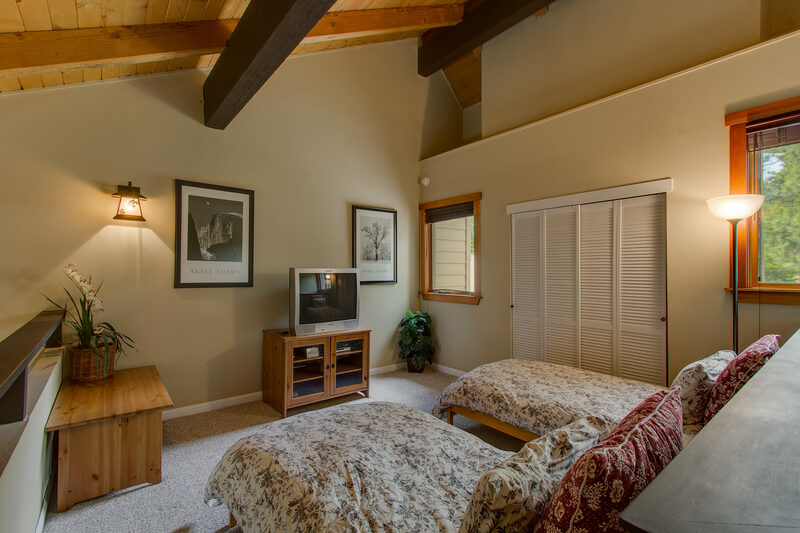 On the loft you’ll find two twin beds and a TV—a perfect space for the kids to call their own. 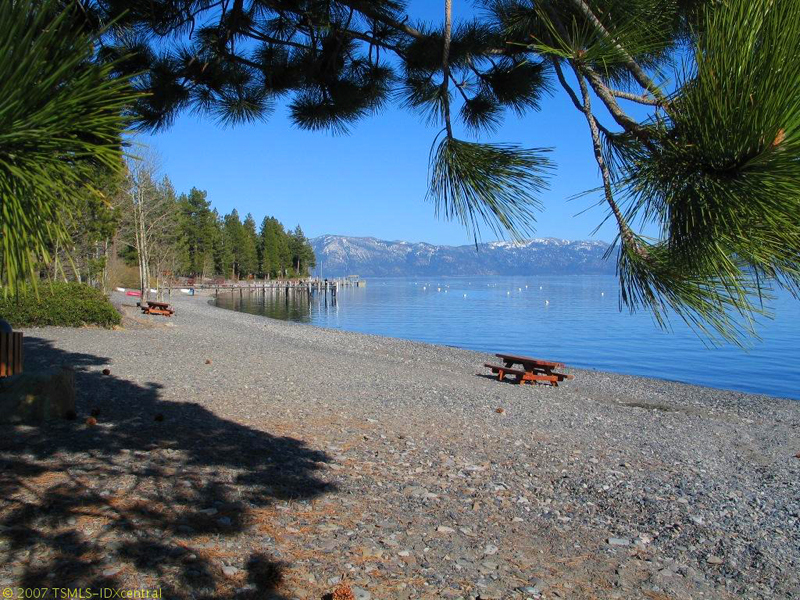 Silver Pine is in Carnelian Bay, where all North Lake Tahoe is right at your doorstep! Stroll down to Magic Carpet mini golf or check out Waterman’s Landing, located at Patton Landing Beach, a 3-acre, pebbly beach known for stand-up paddling. Spent a long vacation here, and it was great. Planning to return soon. We had a wonderful time staying at Silver Pine. The condo is very well maintained and comfortable. We had views of the lake from two private porches. My kids enjoyed the loft and the wifi as well as the rec center. We would definitely recommend staying here! Stayed in the house with one other family for a softball tournament in Tahoe. The place worked very well. Great location, plenty of room, and clean. It was great. Clean, comfortable, relaxing little deck. The filtered view of the lake was so peaceful. 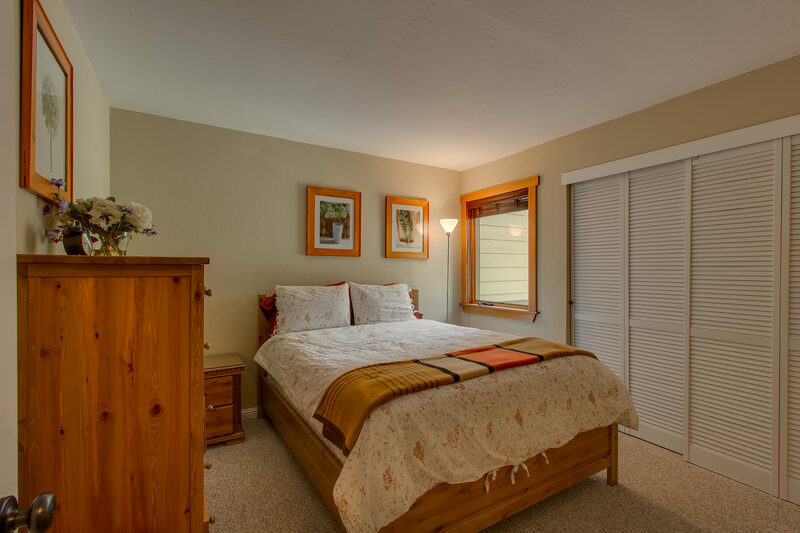 We have stayed in many Carnelian condos over the past 10 years and this unit is one of the better quality ones. Bed linens and bedspreads were fresh and clean, laminate floors are always a plus. Still, attention to detail is missing -- bathroom cupboards are badly scratched up, as is dining room set, and carpeting shows wear and stain, especially on stairs. Kitchen supplies are just adequate so if you are planning on doing any specialty cooking, bring your own supplies. The view is partially blocked by trees, of course, but is still lovely. Smaller chairs on the tiny deck would be welcomed since the two that are supplied don't fit. These are small complaints; the overall experience is lovely and I would rent this condo again. Beautiful, clean unit that is spacious and perfect for lounging. Maintenance staff is friendly and responsive. Trent was prompt to our needs. It was a very comfortable stay. My kids wanted to come back to the same condo. They had good memory here. Everything was as described, everything you need for a good time. After first arriving there were a couple minor things about the place, issue with a chair and the screen door, that I alerted management about as I didn't want there to be an issue with my deposit. They responded promptly and offered to send someone to address the issues. They were minor issues and it wasn't necessary, but I greatly appreciated the quick response. Would stay again. We loved our stay here with our 2 kids. The property was clean and well-maintained, just as described. It was very well-equipped and well-furnished. There were games and books for our kids and a complete kitchen for full meals. Our kids loved coming back and relaxing here. Carnelian Bay is a great location, close to everything, and yet quiet and peaceful. I can't recommend this home enough. 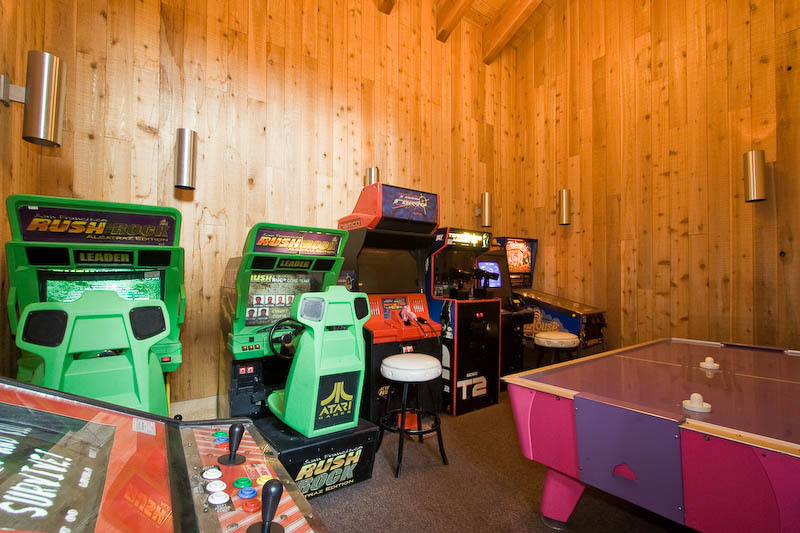 We'd definitely want to come back and stay here on our next visit to Tahoe. We had a nice time at the townhouse. It was centrally located to the ski areas that we went to. Quiet setting off the main highway. Near the restaurant Gar Woods Grill and Pier that has the best food. We had a great time with our kids and their friends at this wonderfully appointed, laid out, and stocked home. 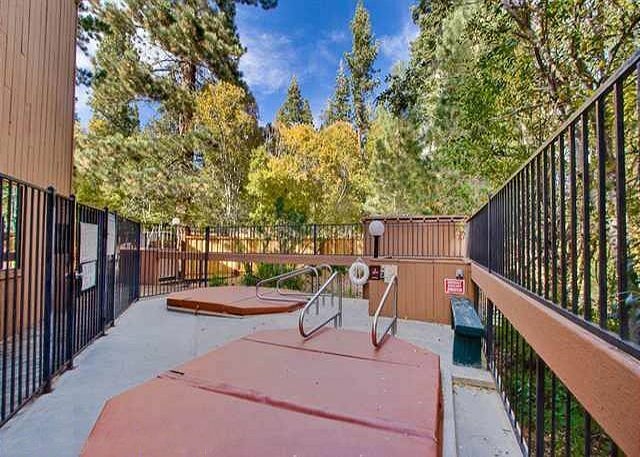 Great location close to everything with awesome pool, spa, bocce, and hiking. Cannot wait to go back. Very nice unit, comfortable, clean and attractive. Located near Northstar, Truckee, Tahoe City. We had a great time! From beginning to end, our experience at CW132 was seamless. Booking, arrival/departure instructions and payment were quick and easy. I appreciated First Accommodations prompt responses to may emails. We area a family of five. This was our first time taking our kids, ages 10, 12 and 14 to Tahoe. The first thing that I noticed was how incredibly clean and updated the unit was. The condo itself, doesn't appear to be incredibly new, but there is obvious pride in ownership in that fixtures, appliances, paint, carpet, etc are nicely kept. The unit was spacious enough for all of us. The unit is very quiet and relaxing. The Carnelian Bay area is very laid back, low key, so it was perfect for us. We loved our stay and look forward to staying there again. Great location, quiet, and good view of the lake. The pool is surrounded by trees. We are a family of 4, and definitely would love to visit again. Had a wonderful vacation at Carnelian Woods #132. Property is exactly as described and check in and out couldn't have been easier. Clubhouse and pool were even better than the pictures due to recent renovations. Location was very central to the places we wanted to visit on the North end of Lake Tahoe. We viewed Labor Day Fireworks right across the street at the beach. Views of the lake off the back deck were a nice extra. Overall fantastic experience. I went with a group of friends and from beginning to end, our experience at CW132 was great. Booking, arrival/departure instructions and payment were quick and easy. Property is exactly as described and check in and out couldn't have been easier. I appreciated First Accommodations quick responses to may emails. Nicely done aesthetically, but very dark due to trees in front of the balconies. Lamps perfect for entertaining, but not bright enough to find a spot to sit and read. Living and dining furniture attractive but uncomfortable. Pots and pans need updating. We took the kids up to Tahoe for some snow play. And this place worked out great. Good location for getting around and quiet. The managers were good to work with. The internet was really slow but lucky I didn't need to do much work or it would have been more of a problem. That would be my only compliant. 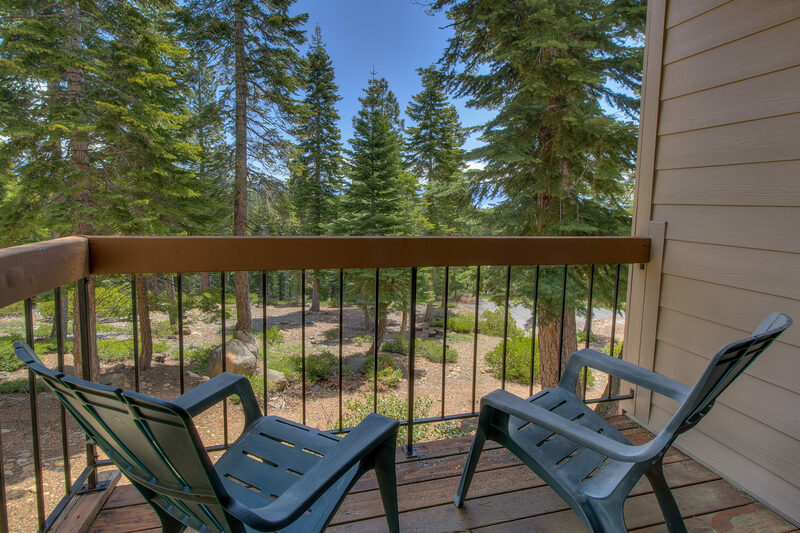 Great amenities, and location; and a nice view of the lake from the balcony. There was no kleenex or napkins. Several light bulbs burned out. The condo is very dark. Needs higher intensity light bulbs? The rental co sent us the info on the place we are staying at the end of Sept. Not the one for this time! 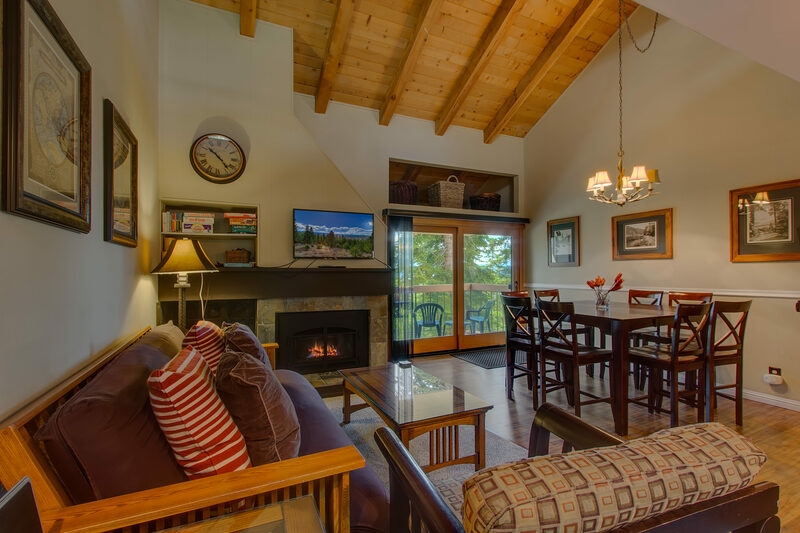 Wonderful cabin in Carnelian Bay, a great getaway after a day on the lake. We really enjoyed the space - it was plenty of room for 7 people. We loved the kitchen and fridge, it allowed us to make meals on our own and enjoy our time in the house. The rental was clean and as advertised. Information from the management was clear and they were easy to deal with. I would recommend this rental to friends and we'll probably be going back again. This rental was one of the best condo rentals I have ever stayed in. Most rental properties have average furnishings and ammenities. This place had nice upgrades and made us feel more like home. I would stay here again in a heartbeat! The property was nice, older complex but this unit recently renovated and nicely done. View was nice. Wasn't as happy with the location of the hot tub. Couldn't find the Rec Center on Day one, even with the map. No signs on property. And, once found, it's too far away from unit so was inconvenient. We have stayed in a few different CW units and this one was the most tastefully and recently updated of them all. There were a few minor issues with the refrigerator and dishwasher which we let the property manager know about and they were slated to be fixed the day we left, per our request. We enjoyed hiking the Par Course on the property, the view from the balcony was peaceful and beautiful, and the master suite bed was very comfortable. My husband and I spent our honeymoon here. It was perfect! We will definitely be staying here again! We've stayed in numerous Carnelean Woods rental units and this one was a great accomodation. A few light bulbs needed relacing and we had to adjust/fix the stopper in the MBR sink on arrival, but everything else was lovely. We live in Peru and every year we travel to California to visit my in-laws. This year we chose Lake Tahoe as our destiny and we were lucky to find this property. The rent was reasonable and the cabin was perfect for us. It was very well kept, beautifully decorated,big enough for 6 people and had everything that was offered. The only suggestion we could make would be about the space in the cabinets. When we got there, the cabinets were full of the owner's food and we did not have enough space to put our own groceries. Apart from that, everything was perfect. We really had a great time. If we have the opportunity, we will go again. We had a great time here. The kitchen was quite large and well equipped, which was great when we got back from the slopes on saturday and had several people helping on the kitchen preparing different dishes. And the living area right next to the open kitchen with the high ceiling was a great complement to keep us all together in one big room having fun and relaxing. There were 3.5 bathrooms, which was a reasonable count. The garage was also spacious enough to fit two big cars, and two more outside. For a group of this size it is one of the best cabins I've been to. This review was meant for another property in a different location. The customer stayed in a 4 bedroom 3.5 house instead of this 3 bedroom 2 bathroom townhome. Thanks for the review. The property was very nice, well maintained and nicely furnished. The reservation and check-in process was also quick and easy. The only minor inconvenience was that the check-out policy required that dishes could not be left in the dishwasher. This means you either have to wait until the dishwasher is done before leaving (10am latest checkout time), or you have to wash and dry breakfast dishes by hand before leaving. Otherwise, no complaints. I would definitely stay here again, and would recommend it to anyone. Great Condo in good location for your winter activities. We had a wonderful stay in this condo for our first white christmas. There was plenty of space for everyone - two adults and two teenagers, after travelling in hotels for a few weeks. Close to shops, restaurants, and great skiing options. Would love to come back again and will be trying to get this condo!